Have you ever wanted to love a game but the gameplay just didn’t click with you? That’s the case with Orbital and me. Developed by BitForge and published by Microsoft Studios, Orbital is a stylish and competently-produced Xbox Live title that has met with great success on other mobile platforms. I’m sure many Windows Phone gamers will like it too, but I simply couldn’t get into it. Shoot past the jump for our full review. If one thing draws me into Orbital, it’s the presentation. 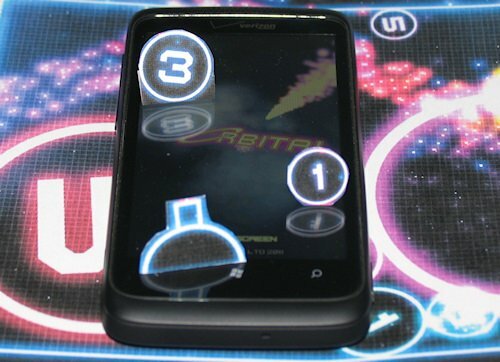 The menus consist of large neon buttons suspended over a scrolling space backdrop. Transitions between menus are animated quite professionally, though the frame rate on the animations is a bit slow. It’s when we get to the actual gameplay that Orbital loses me. The basic gameplay involves firing orbs from a cannon situated at the bottom of the screen. These then reflect off of the wall and come to a stop. Once a fired orb stops moving, it expands until it touches something – either the wall or another orb. Thus orbs vary wildly in size, from tiny to nearly screen-filling, depending on the player’s shot. Each orb also starts with a number inside: 3 or 5, depending on the mode. Every time an orb is struck by their brethren, it cries a little inside and learns to distrust others. No wait, that’s my childhood. Actually, hitting an orb makes its number count down by one; when the number reaches zero, it disappears from the playfield, increasing your score. The game boils down to trying to strike as many orbs as possible with each shot while simultaneously keeping them from landing too far down the screen. If an orb touches the ‘deathline’ at the bottom of the screen, the game ends. If you have too many low-situated orbs or a giant orb near the bottom, it gets quite tough to keep your shots from bouncing into that cruel killing barrier. Supernova: Unlike the other modes, orbs here take five hits to kill instead of three. To compensate for that, Supernova features a unique combo system. When an orb gets destroyed, it emits an explosion proportionate to its size. Orbs hit by this explosion reduce their countdown number by one, so chain reactions often ensue. Supernova is also the only mode that allows gamers to directly aim the cannon. The cannon’s laser sight helps to judge where your shot will first strike, but it doesn’t show where it’ll end up after bouncing. 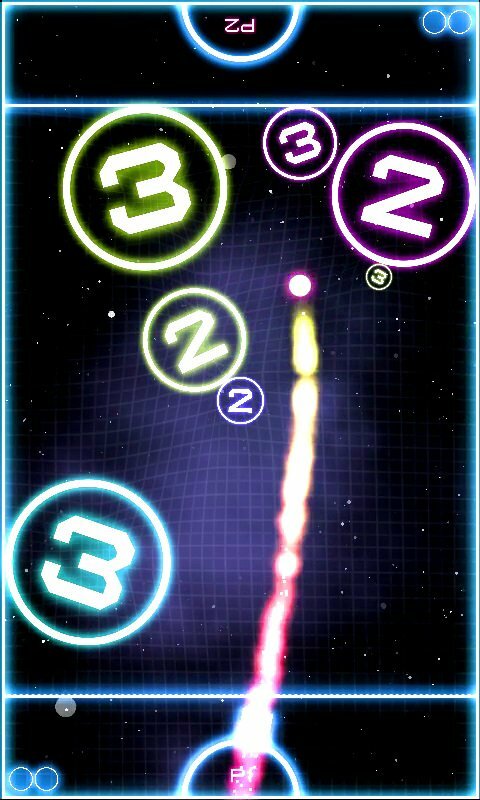 Gravity: Stationary orbs in this mode emit their own fields of gravity, causing moving orbs to veer towards them. This often results in orbs clumping together, which can be helpful sometimes and harmful others. Pure: This game type works like Gravity but without the gravity. It’s the simplest form of gameplay, but the lack of aids like a combo system make achieving high scores difficult. 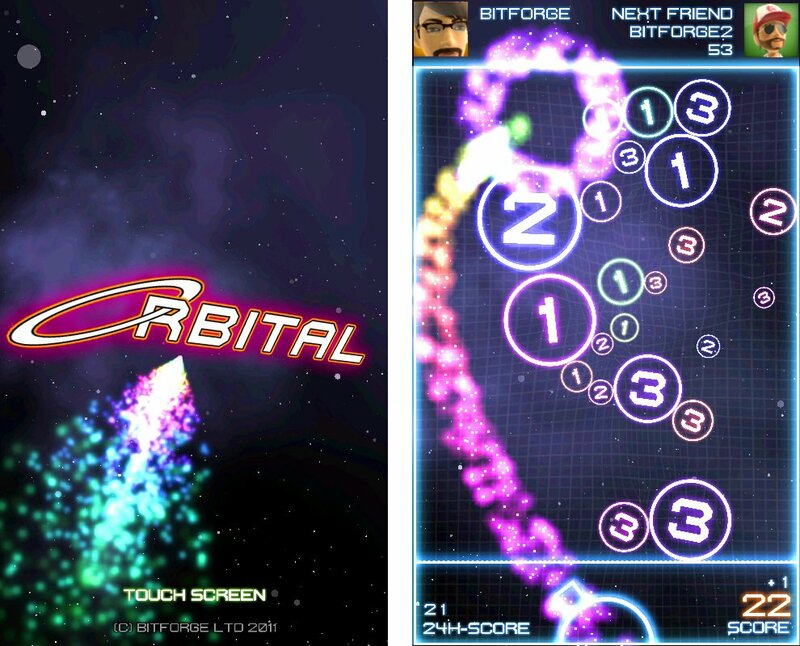 Multiplayer: I’m not a huge fan of same-screen multiplayer on phones, but Orbital’s is at least fairly robust. Select one of the three main game types, set the number of rounds, and then the competition begins. Each player controls a turret at opposite ends of the playing field, taking turns with their shots. The object is to cause your opponent to cross his own death line. Multiplayer has sort of an air hockey or pool vibe and I enjoy it a bit more than solo play. Why didn’t I have more fun with Orbital? Since there is no overarching goal or progression system, the game basically consists of brief high score runs in the mode of your choosing. That brevity is the problem; specifically, it’s so easy to die in this game. I never discovered a strategy that put me a secure enough ground to last very long or achieve decent scores. However hard I tried, I always ended up with a giant orb blocking my shots or a seemingly innocuous shot raveling too far and resulting in my demise. The game’s Tutorial and Help sections can teach you how to play, but they don’t teach how to play well. Further complicating matters is the aiming system. In Gravity and Pure modes, the cannon moves back and forth on its own and you just tap the screen to fire when ready. That mechanic really doesn’t work in a game that’s all about carefully considered distances and reflections. But Supernova’s manual aiming drops the orb as well. It’s way too difficult to move the laser sight precisely; the tiniest finger movement changes the trajectory by multiple millimeters. Worse, aiming and firing are tied together instead of separate. Lift your finger and you shoot. Had there been a separate fire button it would be much easier to fire two shots with the exact same trajectory, but instead players have to manually aim each shot. The difficulty I faced with Orbital’s general gameplay extends to its Achievements too. You’re bound to get several of them over time, including the ones for destroying two orbs with one shoot or playing 100 games. The two multiplayer Achievements are also gimmes since one person can simply play both roles. Get the easy Achievements out of the way and several onerous ones remain. Supernova and Gravity both have score-based Achievements that are way beyond my abilities (though not some of my friends, we should note). The Achievements for getting three close calls in one game and 10 triple shots in a game are also tough and no fun to shoot for. Yip Yoo’s Achievement Guide offers some advice, but you’ll still need plenty of persistence and skill to earn the full 200. I wish I could say that I had a great time with Orbital. But I just couldn’t come to terms with the core gameplay, and there’s nothing else beyond that to keep players busy. With better aiming and some visual aids for lining up shots (such as being able to see where an orb will actually stop), Orbital would have much greater appeal. Instead, only gamers who really dig the reflection-based gameplay and hunting for high scores will get much playtime out of this game. Orbital costs $2.99 and there is a free trial. Pick it up here on the Marketplace. The difficulty I faced with Orbital’s general gameplay extends to its Achievements too. You’re bound to get several of them over time, including the ones for destroying two orbs with one shoot or playing 100 games. The two multiplayer Achievements are also gimmes since one person can simply play both roles. Get the easy Achievements out of the way and several onerous ones remain. Supernova and Gravity both have score-based Achievements that are way beyond my abilities (though not some of my friends, we should note). The Achievements for getting three close calls in one game and 10 triple shots in a game are also tough and no fun to shoot for. Yip Yoo’s Achievement Guide offers some advice, but you’ll still need plenty of persistence and skill to earn the full 200.